Are you looking for Facebook style wall post application. It contains update, comment and delete with jquery animation effect. In this post I had combined some of my old tutorials demos in single page. Take a look at this live demo. You really like it. Download Script Only for Email Subscribers. 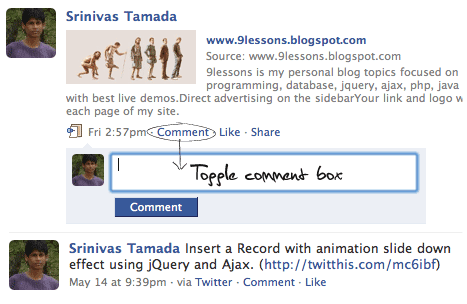 Update and Delete Records with Animation Slide Effect using Jquery and Ajax. Srivanas i must to say... u are awesome really n.n uare the best (im the same of the first comment) xDD i really lover your site :3 greetings from spain bro'! im a big fan of yours. You never cease to impress me, thanks! anyway, I'm curious about this code..could you kindly send to me the codes? thanks super! ohhh.. sorry, SRIVANAS! :) typo. hi.. thanks 4 ur nice script... iam a member but i cant able to download the script.. wat can i do? Heya, looking forward to getting your script. :) You are awesome. This is a very interesting script, I would definitely be interested in receiving it. We are still waiting forthe script, when u will send it? Today I will send this script to all my subscribers. Nice script! Thanx a lot for the work ! There's an little error for me on ... com_id INT PRIMARY KEY AUTO_INCREMENT. Change the . for , and it's work ! I dont want that dialog box with How to remove Sure you want to delete this update? There is NO undo! How can I just click and delete with no question? hi... can you send me the script please..
HI, I am a fan of your script, its great. I would like to know if the belwo is possible with yur script and how to do it. 1. I typed a url address starting with http:// but the comment is not visible appearing as a link, which happens in facebook. how do I achieve it? 2. I also wanted to know if the below is possible.... I have a url of am image and similarly url of a video.. so now If I type that url what should happen is that it should show me the image or the video directly after I hit the button update.... is this possible and what should I do for the same. request your attention to both the above queries. can i use it in asp language? I am a subscriber of this script and i want this script. I also wanted to know if the below is possible.... I have a url of am image and similarly url of a video.. so now If I type that url what should happen is that it should show me the image or the video directly after I hit the button update.... is this possible and what should I do for the same. First of all thank you for taking time and effort for making the script. I would like to use it and just subscribed to your RSS newsletter. Can you send it to: lou_it[at]hotmail.com. Thank you very much and keep up the good work! So how do we get source codes for your posts now? Must we ask for each one individually, or am I misunderstanding something? And yes, I am an email subscriber. I like your work yaar...u real done nice job here..
can u send me this script? Can yaou send me this script? hi i subscribed but how do i get ? Thanks for a great script, I will wait for the next round of mail subscribers for the script as Its non-urgent, carry on the excellent work! I subscribed. Can you send me the script plz? serhatozan [@] gmail.com, i need you to send me your script too :) thanks. this looks great, I registered but haven't received anything. could you send to [email protected] ? can you send me a copy of this script pls.. i really need it for my web application. I subscribed to your blog and also mailed you regarding the script, will you please send the script, would really like work on this script. Hi mate im waiting too so if you could send it to: [email protected] ill be great! I've already subscribed my email , pls send me an awesome script. I'd like to try this script in my project ^_^. great script but did anyone igure out how to display the status with id? can anyone help with showing old update please? thank you!! i have now a wall per user with profile picture the only thing im missing is security settings and time of posting on the post!! "hi all, i cant write a & and this text is away. awaaaaayyyy"
and the text after the & is away. Srinivas Tamada can you help me, please?! Why does the code not show posts from the db when page refreshes? I have seen script , but do you have any feature like same textarea like facebook , google buzz with that same I can add photo , video and other links ?? If this is with you than it will be greate appricate for me with this code.. Thanks in advance , waiting for your reply. Forgot to attach my email , that's [email protected], thanks! and i press delete it goes to top and not stay on same spot as down? Hi i love your app and your scripts. I was wondering how to get this to work with the database. Does this version require making a new db.php as well as a new database or will it work with the db.php file from your other tutorials? If it does need a new database, could you provide me with the code? I have very little experience and making them. Thanks and keep up the good work! Hi, love your script!! I just subscribed but not able to download it. I really appreciate if you send it to s1lverain at hotmail dot com. Hi. I´m suscribed yet but I don´t receive it. I sent a mail to you. can you send me the script plz? e.g 'hello' will cause error message, how could i fix it? I can help with some of these issues. I fixed them on another version of this script. Only need the new version. Haven't seen it in email as of yet. I can post empty message , using a new paragrapf . How do I download the script? but why u not share it my brother?? I am your subscriber but how I can download the script. I was wondering how to get this to work with the database. Does this version require making a new db.php as well as a new database or will it work with the db.php file from your other tutorials? If it does need a new database, could you provide me with the code? I have very little experience and making them. Thanks and keep up the good work! Hey this code is great. How do I get the old comments to appear when the page refreshes. Hi Srinivas really nice work!! Greetings from Mexico, can i get a copy of your source code I am your subscriber but how I can download the script. I love all the tutorials and the elegance that they have. I really need someone to help me convert the "tolink.php" file so that it doesnot use the eregi_replace function but uses the preg_match!!! First of all thanks for the code to get me started. I will post the changes with all the source code sometime this week. You can view the live demo here. 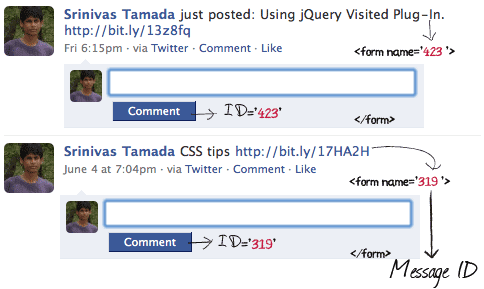 does anybody have a definate answer to solve the problem with the posts not showing after the page has been refreshed? Hello, this is really great. but how can i get this files? hey I was wondering how do you show comments associated to old post because i got the old post showing after refresh I was just wondering how to show the comments... ?? Hey Srinivas, the demo isn't working anymore. Will you update it please? Do you happen to have a copy of the original version set-up to "reload" (after page refresh) from the database all previous posts and comments? I have a test version of the original coding working the way I want, except when I "reload" or click to refresh the browser page, I can't seem to get the "add another comment" box to display properly after the last comment read from the database. I just didn't want to try upgrading to the newer version yet, unless "reload" is impossible in the original version. I really like the easy of use coding from the original version, very easy to follow and understand. hey, thanks for the script. "Function eregi_replace() is deprecated in tolink.php in line 6". You blogs are so useful and handy to work on.